Our solar panel diagram shows how solar energy is converted into electricity through the use of a silicon cell. The below image is not a solar panel wiring diagram. If you need access to a wiring plan, you should consult a specialist electrician or solar installer. In the diagram above, you can see how a solar panel converts sunlight into energy to provide electricity for a range of appliances. This energy can be used for heating, through the use of solar hot water panels, or electricity through the use of regular solar cells. 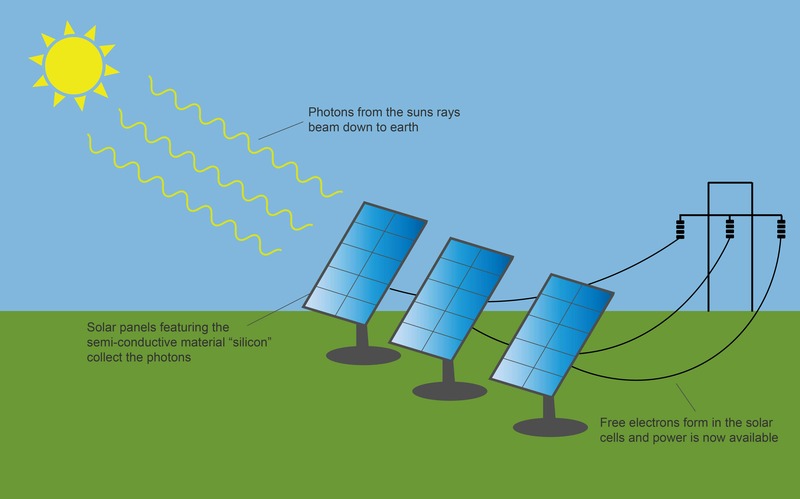 As you can see from the above diagram of a solar panel, photons are contained within the suns rays and beam down to earth. Once these photons reach the solar panel, they are absorbed by the silicon material, and this allows electrons to be knocked off their orbit. As electrons are knocked off their orbit, they become what’s known as ‘free electrons’ which are able to pick up a current, resulting in the flow of electricity to external sources. Technological breakthroughs continue to improve the efficiency of solar panels. This only helps to assert their position as a viable alternative to fossil fuels when it comes to electricity production. As the solar panel diagram shows, you can see how power is sourced out to various locations. The final destination depends on how you plan to use the energy harnessed by your solar cells. A common use of solar electricity is to incorporate it into an existing power supply. This helps to reduce the amount of electricity that might be required from other sources, possibly non-renewable sources. The electricity generated by a solar panel can also be used to charge batteries. This allows the electricity to be stored for later use. Some owners of solar panels even have their systems hooked up to their national electricity network so they can sell back any leftover electricity. This process is commonly referred to as ‘net metering’ in the United States and other countries. By using a different design of solar panel, they can even be used to heat water. This technology, known as solar thermal energy is becoming increasingly popular around the world. Swimming pools can make use of solar thermal energy to heat the water. Installing the right number of solar cells for this purpose can however be a very expensive option. Solar energy has a huge advantage when it comes to providing electricity in remote locations. The technology can be used to generate electricity relatively quickly and cheaply in comparison to traditional power supplies. For a more in-depth list of the advantages and disadvantages of solar energy, check out our page covering the pros and cons of solar energy. A remote solar panel system can provide electricity for vital tasks where the installation of electrical cables is not practical or even impossible. A key example of this is on satellites.